According to Panasonic UK's Barney Sykes, looking at figures from one retailer paints a very promising picture. "The GF5X [the version sold with the premium X lens] in one week outsold the GF3 at any point in its life. So, in its first week of sale, the GF5 was a bigger seller than any week of GF3 sales," he said. "Feedback from Japan is that the GF5 started really well, in Japan it's also outselling the GF3, so we're really pleased." 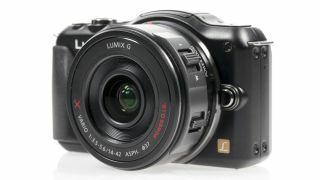 The news that the Panasonic GF5 "X" kit is selling well is particularly interesting, given that it's a more expensive proposition. Offering a power zoom, rather than the traditional ring around the barrel operation, the lens is extremely compact and makes the GF5X barely bigger than some compact cameras. "What's so pleasing for us now is that the X lens is proving so popular, a lot of retail partners are saying that even though it's not entry-level price, they would rather take the X kit variant now, because customers are seeing the benefit of having a collapsible lens, it's a big talking point when they're demonstrating the camera," Sykes said. The GF5 made its debut just 10 months after its predecessor, leading some to question the differences between the two. Sykes is keen to point out the advantages of the newer camera. "When you get into the nuts and bolts, it's significantly improved, a lot of the features are really about what Panasonic's about, trying to add value for the customer, trying to make it much easier for the customer to use, especially for first-time users." "In Japan, it's particularly the scene guide, the in-camera tutorials, which has been really highly appreciated, so that's something we'll be looking to capitalise on here," Sykes said.